There was a time on Earth, about 635 million years ago, when almost the entire planet was covered in ice. At least, this is the idea underlying the Snowball Earth Hypothesis, which holds that there was a massive ice age before the proliferation of complex, multicellular life. Though it's still controversial, geological evidence supports the hypothesis — and suggests that Snowball Earth may have been integral to the formation of an atmosphere friendly to life. Scientists call it the Marinoan glaciation period. It's an idea that's been around for well over a hundred years, but the theory was revived in 1998 by Paul Hoffman and Dan Schrag. Their analysis of negative carbon isotope anomalies in prehistoric carbonite rocks suggested that all biological life (namely eukaryotic and prokaryotic life) came to a grinding halt in the oceans for a period of about a million years. "This collapse can be explained by a global glaciation (that is, a snowball Earth), which ended abruptly when subaerial volcanic outgassing raised atmospheric carbon dioxide to about 350 times the modern level," they wrote. This rapid turn of events, they said, would have resulted in a warming of the snowball Earth to extreme greenhouse conditions. The resulting phase is known as the Marinoan meltdown. As the Hoffman and Schrag study suggests, much of the evidence in support of this theory comes in the form of sedimentary deposits that appear to be glacial in origin — deposits that are located at tropical paleolatitudes (i.e. deposits that were located in tropical regions at the time). And indeed, the Earth's landmasses were primarily situated in the tropical regions during the Marinoan. But not everyone is convinced that volcanic activity was responsible for the Great Thaw. Writing in Proceedings of the National Academy of Sciences, geologists Huiming Bao and three of his graduate students have put forth an intriguing theory suggesting that it was the Marinoan glaciation period itself that instigated the proceeding greenhouse heat wave. Essentially, the million-year Snowball Earth period resulted in a significant atmospheric shift in carbon dioxide levels — one so dramatic that it hasn't been equalled in geological history. Under normal circumstances, CO2 levels in the atmosphere are in balance with levels found in the ocean. But Bao suspects that a thick layer of ice could have cut off the connection between water and air, resulting in a dramatic rise in atmospheric CO2 levels. In fact, the authors draw a comparison to modern global warming. 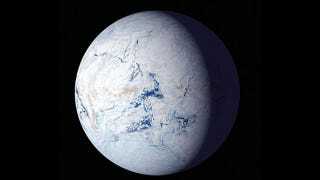 As a result, the Snowball Earth created the conditions for extreme changes in atmospheric chemistry that eventually lead to the rapid end of the Marinoan glaciation. But not only that, it allowed for the conditions suitable for life and the Cambrian Explosion that soon followed. In addition to creating a more temperate climate, the phase also resulted in modern levels of atmospheric oxygen. Bao and colleagues were able to make this determination by using available radiometric dates from areas near layers of barite deposits (a common mineral deposited in rocks following the Marinoan glaciation). The geologists now call this phase the Marinoan Oxygen-17 Depletion (or MOSD event), a period which may have lasted as long as one million years. The oxygen-17 isotype was critical to their analysis, as only an event like this one could have resulted in the large deviations seen in the normal ratio of O-17 to O-18 (with respect to O-16 isotopes). "If something unusual happens with the composition of the atmosphere, the oxygen isotope ratios can change," noted co-author Bryan Killingsworth through a statement. "We see a large deviation in this ratio in minerals deposited around 635 million years ago. This occurred during an extremely odd time in atmospheric history." These findings also demonstrate that the Earth is capable of recovering from severe geological conditions at a rapid pace. "Mother Earth lived and life carried on even in the most devastating situation," wrote Bao. "The only difference is the life composition afterwards. In other words, whatever humans do to the Earth, life will go on. The only uncertainty is whether humans will still remain part of the life composition." You can read the entire study at PNAS.